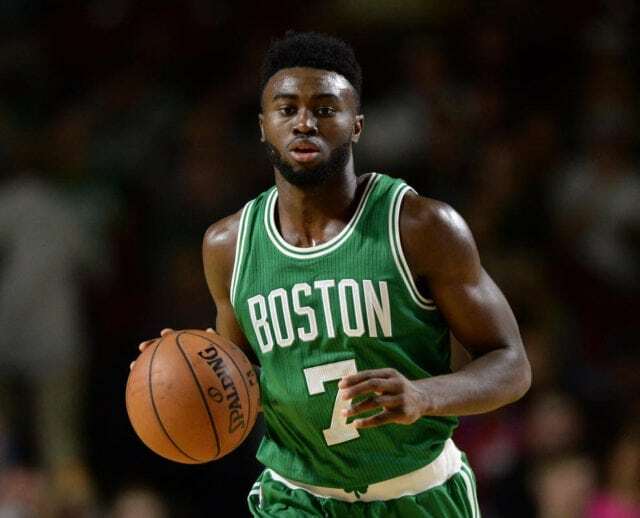 Jaylen Brown is a fast-rising American professional basketballer who has come a very long way in the profession in a rather short while. He began playing professionally after he made the 2016 NBA draft and was picked by the Boston Celtics with the third overall pick. Before then, Jaylen played for the Golden Bears of the University of California, Berkeley and proved to be an all-around prospect as a result of his strength, fitness, agility, and other physical qualities. As a professional, he plays as a small forward and sometimes, as a shooting guard. Born on October 24, 1996, in Marietta, Georgia, Brown is the son of Mechalle Brown (mother) and Quenton Marselles Brown. He grew up in Georgia where his mother, with the help of his grandmother, raised him alongside his elder brother, Quenton Brown (Jr). Having come from a family of sportsmen, Jaylen found himself growing up in a sports-friendly environment. His father, a professional boxer, is the 2016 World Boxing Union champion while his brother is an American football defensive lineman. Although he continued playing as he grew up, the most important thing to his mother, who holds a Ph.D., was for him to get educated. Before he started playing as a professional, Brown attended Joseph Wheeler High School in Marietta, Georgia and the University of California, Berkeley. During his time as a senior in high school, he hit two free throws within 0.6 seconds which helped his team emerge victorious in the Georgia High School Association (GHSA) AAAAAA state championship. Also as a senior, Brown made an average of 28 points and 12 rebounds while leading his team to an overall record of 30–3. Due to Jaylen Brown’s athleticism, Scout.com, 247Sports.com, and ESPN all rated him a five-star recruit. He was also ranked as the fourth-best recruit in his class by the aforementioned sports outfits but was ranked third by Rivals.com. By the time Jaylen was done with his high school career, he left the school with his shoulders high, having been named Gatorade Georgia Boys Player of the Year, USA Today’s All-USA Georgia Player of the Year, Georgia’s Mr. Basketball, and the Class 6A Player of the Year. At the university, the fresh talent played for the Golden Bears for one year under coach Cuonzo Martin and proved to be an invaluable asset. In 2016, he earned first-team All-Pac-12 honors and was named the Pac-12 Freshman of the Year. In 2016, Jaylen was drafted to the NBA, he was selected with the third overall pick by the Boston Celtics on June 23, 2016. On July 27, 2016, he signed a three-year contract with the Celtics worth over $14 million dollars and made his debut for the team on October 26 in the game against Brooklyn Nets. In 2016/2017 season, Jaylen was highly productive, appearing in 78 games during the regular season, with 20 starts. He recorded a 17.2 minutes average on the floor, 6.6 points, 2.8 rebounds, and 0.8 assists. Consequently, he was named to the NBA All-Rookie Second Team at the end of the season. During the 2017-2018 season, Jaylen Brown recorded high points in his first three games with 25 points on October 17, 2017; 27 points on November 18, and 26 points on December 13. He, however, had to miss two weeks in March as a result of concussion but returned on April 6, 2018, to set another career record for himself with 32 points which contributed to the 111–104 win over the Chicago Bulls. He continues to make exploits in Boston Celtics and at 21, he became the youngest player in team’s history to score 30 or more points in a playoff game. Based on the contract he signed with the Celtics, Jaylen’s annual salary began at almost $5 million dollars for the first two seasons (2016/2017 and 2017/2018 seasons). It will, however, increase to more than $5 million, $6 million, and 8million in the 3 seasons ahead until 2020/2021 season. Besides sports, the young star also makes money from endorsement deals with brands like Adidas. Presently, his net worth is said to be more than $5 million dollars. Jaylen Brown suffered a concussion on March 8, 2017, after a very scary fall. He landed on his head and neck after a dunk against the Timberwolves and stayed motionless on the ground before he was helped back up on his feet and walked off the court on his own. Basketball is one of such sports dominated by very tall people and it is not different for Jaylen Brown. He has an athletic structure which has helped him so far in his career. He is 6 feet 7 inches tall and has a body weight of 225 lb (102 kg). His wingspan measures 6′ 11.75” while his hand width is 9 inches.